Add a sense of natural calmness and serene elegance to your outdoor decor. Timeless and eye-catching, avid birdwatchers use bird baths to attracts various species of birds to gardens, patio area, and backyards. ※ Durable Construction: Pedestal-styled bird bath is constructed of weather and frost resistant resin for a durable, yet lightweight build so you can move this bath to the perfect spot effortlessly. ※ Eye-catching Décor: This decorative piece features an antique verdigris effect, mimicking a time worn and rustic finish,which adds an eye-catching element to your garden or backyard. 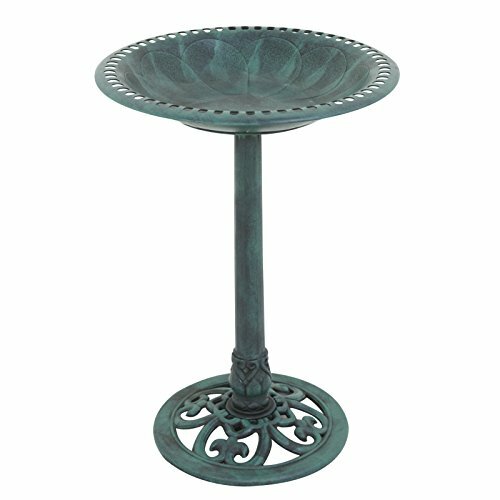 ※ Elegant Design: This pedestal bird bath base is designed with Fleur-de-Lys accents while the single bowl has scallop-like engravings,a gorgeous addition to any yard or garden. ※ Easy Assemble: 3 Ground stakes are included and filling the base with sand is recommended for added stability. Hexagonal center pedestal cleverly threads into base and bowl sections for easy no tool assembly.